Thank you Linda for providing the reference photo of CWD Mazzie NDD. In March of 2016, a retired couple named Jim and Linda Crismer adopted a dog. Three lives were forever changed. Before CWD Mazzie was rescued by Mission K9 Rescue, he had served five years in Kuwait as a Narcotics Detection Dog. He patrolled airports and Iraq/Kuwait border. He must have had a hard life there because he only weighed 60 pounds when he arrived in Houston. His journey to freedom was a 36 hour flight from Kuwait through France and ending in Houston, TX. While in Houston Mazzie gained about 20 pounds, so he was a healthy 80 pounds when he met his forever mom and dad. After a year of waiting for their hero, Jim and Linda go the call from Mission K9 Rescue in March of 2016. They traveled from Utah to Texas to bring CWD Mazzie to his forever home. Once in Utah, Mazzie experienced things to help build his confidence. A company that trains K9s for police departments, Right Hand K9, advised Jim and Linda to expose Mazzie to many new situations. So they took Mazzie everywhere to help him learn that in new places around new people, he would always be safe with his mom and dad. He went to church every Sunday, to the knit shop, Cabela’s,, Bath and Body Works, the grocery store and many other stores. He watched parades and has even been is several parades. He has traveled to Yellowstone National Park and Colorado Springs. One of Mazzie’s favorite things to do is to follow the Jim and Linda’s grandkids, Kade and Savannah, everywhere. The kids always give Mazzie treats, which he loves. They lay on his bed with him, and he lets them rub him, especially his ears. Mazzie has visited children at schools, Scout troops and summer camps. He attended a fundraiser for vests for police dogs. All of these activities have helped Mazzie be more comfortable around new people. He gets hugs and kisses from ladies of all ages. He’s a happy boy. His mom and dad are so proud of this war dog that they love so much. They spend much time telling people about Mazzie’s life, about CWDs and Mission K9 Rescue. Having Mazzie is not like having a pet that was raised from a puppy. The adoption of CWD Mazzie NDD has changed lives. Mazzie is one lucky war dog to have such a loving home. Jim and Linda feel privileged to be the parents of this amazing dog. 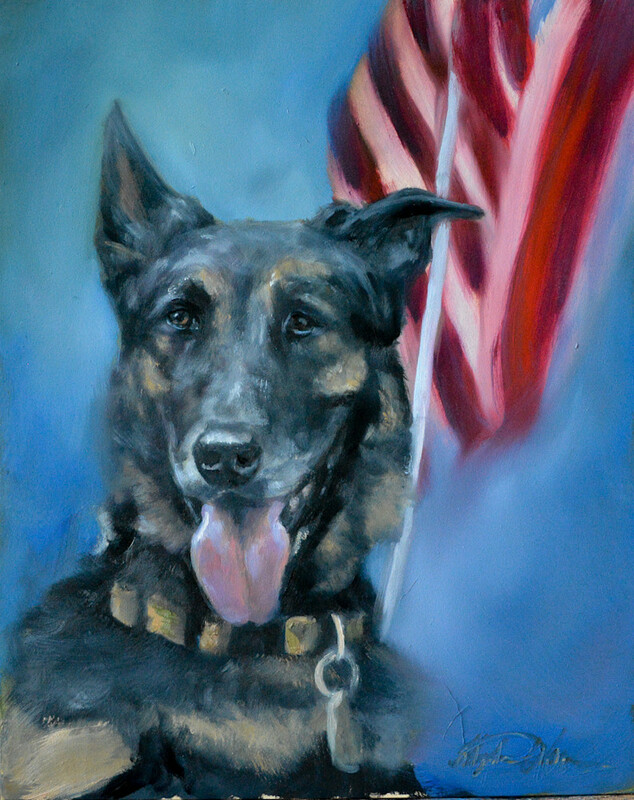 Everyone who meets Mazzie is changed by the experience of knowing this war dog hero.